Capture the glorious colors of Italy’s Lake Como, in this week long plein air painting workshop with Victoria Brooks. Victoria teaches primarily in oil but also teaches in acrylic and watercolor. She will teach you how to paint water and reflections, capturing colorful architecture and quaint vignettes against grand skies and the cobalt blue of Lake Como. Victoria teaches the methods of simplicity to help you get the next level, whether you are a beginner or experienced painter you will grow as an artist and come home with beautiful painting studies to document your trip. She will work to encourage your personal style. Sharing the steps she takes, she will cover: Story, Composition, Technique, Color, Values and Edges. Victoria will demonstrate how she uses these elements to create fresh, loose plein air paintings as a group and one on one. Victoria will also share with you her supplies, including a limited palette. How she sets up, choice of subject and execution. Experience the thrill and beauty of Italy’s Lake Como, and even more so, taking these memories you've created home with you! This workshop is for beginners to advanced artists and will be conducted outdoors on location. Experience the thrill and beauty of Italys Lake Como, and even more so, taking these memories you've created home with you! This workshop is for beginners to advanced artists and will be conducted outdoors on location. 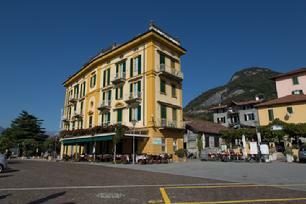 During the week we will be based in Varenna right on Lake Como! We will also visit the villages of Belaggio, Tremezzo, Menaggio and Lenno with quality time for plenty of sketching and painting at each of the towns we visit. And, in true Toscana Americana Workshops style, we will move about the lake by boat and explore the local Italian culture, cuisine and wines while dining in local restaurants never far from the waters of Lake Como! This is bound to be a wonderful week with plenty of opportunity to sketch and paint "plein air" in a relaxed and inspirational setting! Through demonstrations and individual instruction, Victoria will guide participants through a process designed to help obtain greater confidence and pleasure from painting outdoors while improving artistic vision and skill. Participants will enjoy morning and afternoon sessions. See Lake Como photo albums on FACEBOOK! painting among the sights and sounds of beautiful Lake Como: Crystal blue water, centuries-old buildings, narrow winding streets, bold color and vibrant sunlight...all in the shodow of the Swiss and Italian Alps!!! in the warm ambiance of northern Italy's Lake Como, almost unchanged for centuries, one of Italy’s jewels. the joy of learning and gaining plein air skills and confidence with the expert instruction of an acclaimed artist/instructor and the camaraderie of a small group of learners. great Italian food, delightful regional wines, new friends, breath-taking vistas, history and the hospitality of the people of Lake Como. During the week we will visit the towns and villages of Varenna, Tremezzo, Menaggio, Lenno & of course the famous Bellagio!!!. 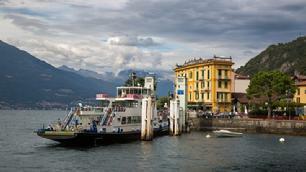 We will travel during the week by ferry as we visit the various villages along the shores of Lake Como! And, in true Toscana Americana Workshops style, we will explore the local Lake Como culture, cuisine and wines while dining in local restaurants! This is bound to be a wonderful week with plenty of opportunity to paint in a relaxed and inspirational setting! Oregon-born Victoria Brooks' path from young art student to professional artist and mentor is an inspiration to both those who appreciate fine art and those who aspire to create paintings that touch people's hearts. Victoria's early interest in art lead to her studies in Graphic Design at Portland State University, followed by a dozen years as an award-winning art director and designer in the television and film industries. As successful as her career in applied arts was, however, it offered few opportunities for Victoria to pursue her first love – painting fine art. Determined to be true to that love, Victoria made the life-changing decision to commit to her dream of becoming an independent, professional fine artist. She resumed her studies in oil painting at the California Art Institute, where – influenced by the work of Sargent, Sorolla, and Zorn, and her own affinity for painting en plein air – she developed a unique artistic voice characterized by a vibrant color palette and an impressionistic personal style. The result has been a body of work with a strong sense of spontaneity and freshness. Indeed, after thirty years of creating paintings that have captured the ephemeral emotions of people in natural settings, resonated with viewers in some 234 juried group or solo exhibitions around the world, and been recognized with “Best of Show” and other awards, Victoria's commitment to her artistic journey is a classic story of how to transform a dream into reality. The work speaks for itself. participant. Milan Malpensa airport (Terminal 1)is the arrival gateway for this workshop and Escorted Group Travel to Lake Como. Return travel is to Milan Malpensa airport (Terminal 1). US$3540.00 per person standard single occupancy. *All-inclusive standard plans are Hotel Olivedo/Villa Torreta plans only. Rooms are assigned on a basis of first-enrollment-received. Lake Como has been a popular retreat for aristocrats and wealthy people since Roman times, and a very popular tourist attraction with many artistic and cultural gems. It has many villas and palaces (such as Villa Carlotta). Many famous people have or have had homes on the shores of Lake Como, such as Matthew Bellamy, Madonna, George Clooney,Gianni Versace, Ronaldinho, Sylvester Stallone, Julian Lennon, Richard Branson, Ben Spies, and Pierina Legnani. 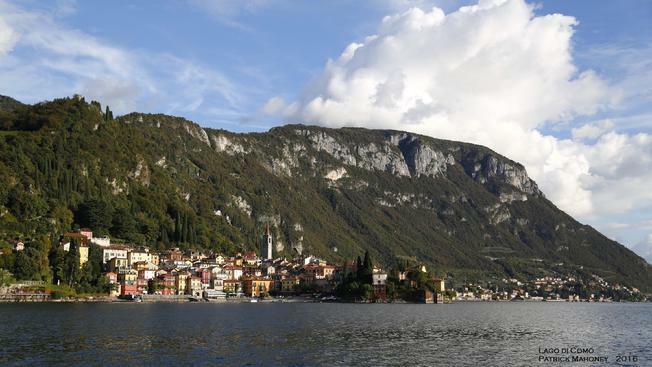 Lake Como is widely regarded as one of the most beautiful lakes in Europe. Varenna is a picturesque medieval village on the east coast of Lake Como. Many elements make it a magical place, such as the unique position in the centre of the lake, the frame of woods and vineyards on the slopes of the nearby mountains, and the sunny climate. Built in the Roman age, Varenna conserves its original forms by presenting itself as a small fishermen’s village, with its typical coloured houses, narrow stone streets and steep staircases. Called “pearl of the lake”, Varenna is also famous for its historical monuments, such as St. George church and the medieval fortress called Vezio Castle, and the ancients abodes of amazing beauty, such as villa Monastero and villa Cipressi.